Secretary-General António Guterres delivers remarks on the US-DPRK Summit at UN Headquarters in New York. 11 June 2018. US President Donald Trump and his North Korean counterpart Kim Jong-un are due to meet in Singapore on Tuesday morning: the first-ever face-to-face encounter between a sitting US President and a North Korean leader. As the UN chief stated, the world is watching. 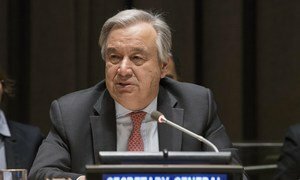 “The two leaders are seeking to break out of the dangerous cycle that created so much concern last year,” Mr. Guterres told journalists at UN Headquarters in New York, referring to escalating tensions on the Korean Peninsula. Mr. Guterres added that UN agencies stand at the ready to support this process. Among them are the International Atomic Energy Agency (IAEA), which works for the safe, secure and peaceful uses of nuclear science and technology. Furthermore, the Comprehensive Nuclear-Test Ban Treaty Organization (CTBTO) could also play a role in monitoring the DPRK’s moratorium on nuclear tests, he added. “I believe that this summit is an extremely important event,” said the UN chief, taking questions from reporters. “I believe the two leaders need to be credited for the courage with which they decided to move forward with the summit and to engage in a constructive negotiation to reach an objective that is vital for us all: the peaceful and verifiable denuclearization of North Korea,” he added. May 10, 2018: President Trump first announces his intention to meet the North Korean leader, on June 12. During his remarks to journalists on Monday, the Secretary-General also drew attention to the humanitarian situation in North Korea, where the UN estimates more than 10 million people, or 40 per cent of the population, require assistance. Aid agencies are seeking $111 million to assist six million in need this year. The funding will support operations in areas such as enhancing food security, reducing malnutrition, and increasing access to healthcare, water and sanitation services. Communities will also receive help to become more resilient in the face of recurrent natural hazards such as droughts and floods. Among the UN agencies active in the country are the World Food Programme (WFP): a presence for more than two decades. The UN agency aims to assist 650,000 women and children there every month, who are being given dietary supplements in the form of fortified cereals and biscuits. WFP Executive Director David Beasley was in North Korea last month to assess needs and evaluate operations on the ground. Mr. Beasley visited several projects including a WFP-supported children’s nursery and a local factory where WFP produces the fortified biscuits for its programmes. “There is a real need for continued humanitarian assistance, especially when it comes to meeting the nutritional needs of mothers and young children,” he said at the end of the four-day mission. The latest report from the UN Office for the Coordination of Humanitarian Affairs (OCHA) on needs inside North Korea, published in April, says that there are "many complex, intertwined reasons" for the country's high rate of undernutrition. It points out that only 17 per cent of land is good for cultivation in DPRK, and that households are having to increasingly rely on farmers' markets beyond the public food distribution system, involving bartering and swaps. Most food is still produced on around 3,900 cooperative farms, with 100 State-run farms focussing on specialized food production. The report concludes that humanitarian agencies have been making progress in meeting the needs of the most vulnerable, partly as a result of "growing confidence building with the Government and engagement with them on humanitarian operations". United Nations chief António Guterres has welcomed the Japan-China-South Korea summit held on Wednesday and their effort to cooperate in ridding the Korean Peninsula of nuclear weapons.